Ah, New Year’s Eve. There's just something about welcoming the start of the year with bubbly that makes the evening so special – the sparkle, the bubbles, the vibrancy – that it almost seems to be celebrating along with you. 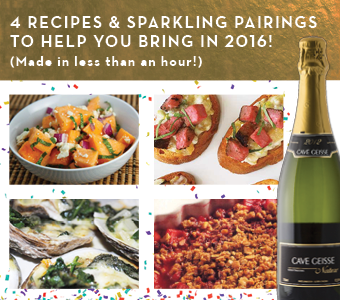 To kick off 2016, we've put together Four Fun & Easy Food & Sparkling Wine Pairings designed to work perfectly with these festive Brazilian sparkling wines! Whether you're the guest or the host du jour, you’ll be sure to impress with simple, delicious recipe ideas. Bonus: each of these recipes can be made in under an hour! The fruity melon in this salad brings out the fruit notes of this bright, sweet asti-style muscatel. The savory feta and refreshing mint add depth and contrast while still letting this sparkling muscatel shine. These crostinis are sure to impress! Easy to make and delicious to eat, they pair perfectly with a dry sparkling wine, like a brut nature of champagne-style method. With “Brut” sparkling wines, no extra sugar is added, offering a crisp, dry taste that is excellent for pairing with salty foods like salty cheeses, steaks, and seafood. The citrus fruit notes of this dish, along with the salty brine of the oysters are a perfect match for a delicate, luscious, and smooth Blanc de Blanc. Made from only Chardonnay grapes, this sparkling champaneoise is a dream for seafood dishes. This rose brut can be paired with both sweet and savory dishes due to its light fruit notes and moderate richness. We prefer pairing it with a rhubarb crisp for its sublime culinary experience - and of course we love that the colors match too! The raspberry brings out the red fruit in the wine, and the bubbles help the tart rhubarb pop! Here’s to bringing in a new year with delicious adventures ahead! Happy 2016!